Are you tired of shooting photos of some common places? If the answer is “Yes”, then you might be longing for getting in touch with some amazing places in the United States of America. And you have stepped on the right place for searching the best places for photography in the country. For your convenience, we have compiled the best places to photograph in the USA to give you a great opportunity for landscape photography. So, what are you waiting for? Maroon Bells, which are located in Colorado, are considered as two of the most photographed places in the United States. The spot is twelve miles from the city of Aspen. Maroon Bells are basically two peaks of the Elk Mountains. Both of the peaks are greatly high enough to catch the attention of different photographers. One is about 14,163 feet high, and the other is about 14,019 feet high. The first one is called Maroon Peak, while the latter is called North Maroon Peak. The peaks are, however, snow-capped all year round. You will find a bunch of walking trails in the area. And the trails are great spots to capture some beautiful photos. Horseshoe Bend is another amazing spot for outstanding photography. It is located in the state of Arizona. As its name suggests, the place was named after its unusual shape–which is like a horseshoe. Those who are looking for an unbelievable natural vista should definitely visit Horseshoe Bend. If you want to get the best view of the spot, you have to see it from a cliff top. And the cliff top is situated approximately 300 meters above. In addition, you can also take some amazing views from the edge. But be careful while approaching towards the edge as it is uneven. The park is considered one of the best spots for photography in the United States of America. It is also regarded as the most famous national parks in the world. There are hundreds of different animals living in the park. And these animals play a vital role to keep the wildlife of the park alive. An incredible variety of flora is another wonder of Yellowstone National Park. There are about 1700 different plants in the park. However, the top spots for photography at Yellowstone National Park are Chromatic Pool, Lower Falls, Morning Glory Pool, Grand Prismatic Spring, Madison River, Grand Prismatic, Dunraven Pass, and Hayden Valley. But these are not the only attractive spots for photography. You will find more eye-catching spots to capture photos at the park. Cape Neddick Lighthouse is a simply gorgeous place. It has gained huge popularity among photographers since they can take some unique photos at the spot. The height of the lighthouse is only 12 meters, but the land is 27 meters above sea level. The lighthouse is, however, located on Nubble Island. And Nubble Island is situated in York, Maine. There are various shooting spots in the area. People do various activities in those spots. For instance, those who go there usually remain busy with fishing and diving. In the beaches, one gets the chance to enjoy to the fullest. And these elements go in favor of photographers. Glacier National Park is one of the greatest places in the United States for photography. Encompassing over 1 million acres, the park is located in the northwestern Montanan. It is basically regarded as the Crown of the Continent. It is also considered as an international treasure. For its natural beauty and popularity, the name of the park is a buzzing phrase among professional as well as new photographers in the country. As a photographer, you will actually find a good number of spots for photoshoots. The main spots of the park, however, are Lake McDonald, Grinnell Glacier Trail, Logan Pass, Elizabeth Lake, and Granite Park Chalet. Have you ever gone to Beartooth Highway? If you haven’t, then you should pay a visit to the place. Located in Wyoming, it is a very scenic place in America. It is, in fact, situated to the east of the famous park “Yellowstone National Park”, and the length of the highway is 68 miles. The highway is a piece of hot cake since its opening in 1936. Any photographer in the world can make the best use of their time from an array of photo shooting spots in the place. By the way, the most attractive spots of Beartooth Highway are Rock Creek Vista, West Summit, Top of the World Resort, and Clay Bute Lookout Tower. And these attractions have made the highway one of the best places for photography in the country. It takes a two-hour drive from the Southern Grand Canyon to the south to reach Sedona. The place offers mesmerizing views of red rock, and photographers can available themselves of plenty of opportunities to take stunning photos of different spots of the place. Though the town of Sedona is moderately small, you will find many forest roads and trials out there. The scenic beauty of the place will make you feel the touch of heaven. Jeep tours, which are good for casual photography, are available in Sedona. But if you have the intention to stay in a spot for a long time, then you should not go for Jeep tours. If you are a landscape photographer, then you might have heard the name of Yosemite National Park. The park is a favorite to a great number of photographers across the USA. It is now gaining popularity all over the world for its outstanding views. That is to say, the park is a great destination for photographers across the world. It is, however, located in Northern California, stretching an area of 3,027 square kilometers. You will find a number of hiking trails, which will help you skip the crowds to capture some unique scenes, out there in the park. By the way, the most attractive spots for photographers are Hald Dome, Yosemite Falls, El Captain, Tunnel View, etc. And these spots will enable you to capture some stunning landscape photos. Located in between Arizona and Utah, Monument Valley stands out as one of the most scenic beauties in the United States of America. In fact, you will get a great number of iconic scenes in the west part of America in the place. Photographers across the country get crowded there to capture those iconic scenes. The main attractions of the place are the sandstone buttes, which are approximately a thousand feet high. The buttes provide tourists and photographers with beautiful views, and many photographers have captured them countless times. Even a number of filmmakers have also featured them in many films. Acadia National Park is a famous place, which is located in the east of America. It is actually situated in Maine. The park has a number of islands that provides photographers with a great opportunity to shoot some beautiful photos. However, one of the most popular spots of the place is Bass Harbor Lighthouse. You will also find some lakes along with a number of mountains out there. These lakes and mountains offer great opportunities for photography. To sum up, Acadia National Park is the perfect place for photographers since it offers outstanding views of lakes, mountains, coast, and forest. The Grand Canyon is located in the state of Arizona. It is a must-see for any photographers in the USA. In fact, The Grand Canyon is a very popular destination for many landscape photographers all over the world. A number of eye-catching spots of the place work behind its popularity. The main attractions of The Grand Canyon are The Visitor Center, Tim Trail, Hermit Road Drive, Desert View Drive, Geological Museum, Bright Angel Hiking Trail, Lookout Studio, and Wild Life View. All these attractions come up with great chances for photographers to capture charming photos of the Grand Canyon. Zion National Park, which is situated in Utah, is a dream location for photographers across the USA. It’s about two and a half hours away from the north of the Grand Canyon. The natural scenario of the park is charming, and you will be enchanted by the beauty of the scenario. The best spots for photography, however, include Zion Canyon, Hop Valley, Towers of the Virgin, Hoodoo Heaven, Kolob Terrace Road, Angel’s Landing, and so on. Remember, there are many other attractive spots for photography in the park. Even you will have the opportunity to get in touch with some amazing places near Zion. Death Valley National Park is another great attraction for photographers across the country. The park is situated in California as well as Nevada. It is a highly beautiful place, which lies below sea level. The park is usually considered as the driest and hottest national park in the country. Though it is the driest national park in the country, it provides photographers with favorable opportunities for striking photos. The most popular spot of the park is the Racetrack, which is a hot piece of cake among photographers for its sailing stones. Besides these sailing stones, a photographer gets the opportunity to capture the milky way. The location is also famous for it provides excellent night landscapes. It is one of the most charming coastlines on the planet for landscape photography. In general, the area of the coastline stretches about 364 miles from the Columbia River to Brookings. A photographer is permitted to travel the entire coastline for the purpose of photography since a landmark bill was passed by the Oregon Legislature in 1967. Though there are many attractions for photographers in the scenic coastline, some of the attractions have become highly popular. The most popular spots of the place are Ecola State Park, Shore Acres, Haystack Rock, Caper Perpetua, Pacific City, and Samuel Boardman State Park. Remember, the best time to visit Oregon is in February. If you are a savvy photographer, Denali National Park can be a good choice for you. The park is, in fact, one of the most popular national parks in the USA. It is located in the state of Alaska, which is well-known for its having beautiful forests and sky-high mountains. The main area of the park, however, is about 6 million acres. For wildlife photographers, Denali National Park is the best place in the country. Though the park has a wide area, it is highly difficult to wander around in much of it. You will find a 91-mile road out there, which is great to photograph some innovative scenes. However, the greatest attraction of the park is Mount McKinley. Antelope Canyon is another great destination for photographers, especially landscape photographers. It is located near Page in the state of Arizona. The canyon consists of the lower canyon and the upper canyon. And both of the canyons are great photography. If you go to the canyon in the summer, you will get to see beams of light in the upper canyon. While entering the lower canyon, you will find it more difficult as there are some narrower areas. By the way, your tour will not go in vain if you can consider some troubles. 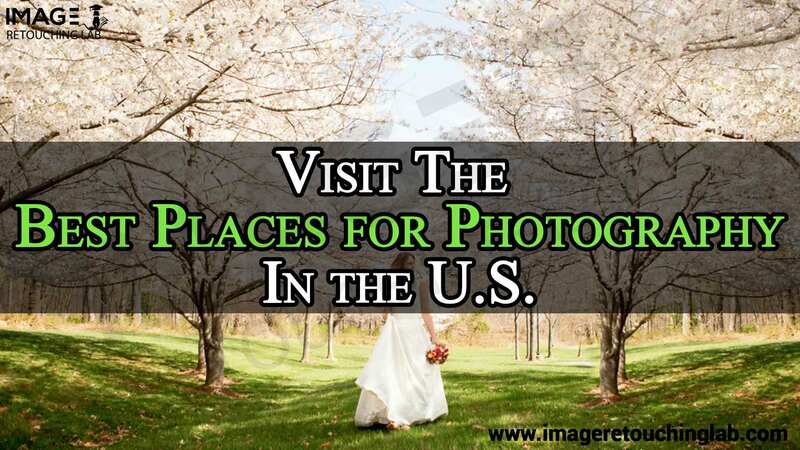 You might have thought that it is hard to find the best places for photography in the USA. Now, you have come to know the top places that are well-known for photography. Let’ set out for any of the places to capture some stunning photos, which will take your career to the next step.